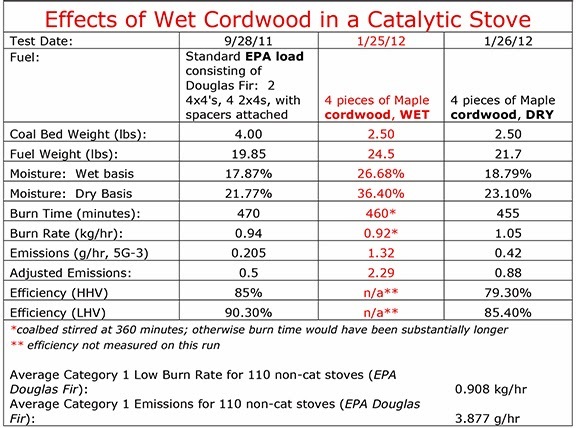 From time to time people inquire about how well catalytic stoves perform when fueled with wet wood. The issue was recently raised in connection with new EPA regulations. The simple answer is that catalytic stoves perform much better than non-catalytic stoves at low temperatures, low flow rates, and with wet wood. The test data and video are below. Note that we do NOT recommend using wet wood. Efficient performance at low burn rates (with dry wood) is a huge advantage of catalytic stoves. More test results will be posted over the next few weeks. HPBA recently demonstrated to the EPA, and some state regulators, the failure of non-catalytic stoves to burn cleanly at low burn rates and/or with wet wood. This presentation was allegedly an attempt to convince regulators to relax the “low burn standard” so that non-catalytic stove manufacturers could “make better stoves”. It needs to be said that high emissions at low burn rates is a problem that is specific to non-catalytic stoves. Catalytic stoves are able to burn efficiently at low flow rates, low temperatures, and high moisture contents. This simply isn’t true for non-catalytic stoves, which are acutely sensitive to wood moisture content as well as temperature, flow rate, and operator behavior. To illustrate the difference, we ran two tests recently with cordwood: one with 4 pieces of very wet maple (36.4% wet basis), and one with 4 pieces of dry maple (18.79% wet basis). You can see a video of these tests at http://www.youtube.com/watch?v=CmReSRqaquE or go to You Tube and search under “Woodstock Soapstone Wet Wood”. In spite of using cord wood, we followed formal test procedures: there was no operator influence save for a single stirring of the coal bed very late in the wet wood burn (it was at the end of the day, and the undersigned operator wanted to go home). In 2010, HPBA produced a list of 110 non-catalytic stoves still approved and in production. Our results with wet cordwood burned in a catalytic stove are better than the results of over half of these 110 EPA approved non-catalytic stoves with an EPA test load at either Category 1 or Category 2 burn rates. In other words, over half of all current non-catalytic stoves produce more emissions with EPA test loads than the subject catalytic stove produced with wet cordwood. Please note: we are using catalytic technology not available during the last NSPS. We are using catalysts made of stainless steel “durafoil”. The thickness of the material is about 0.004” (4/1000), and where it is bonded the maximum thickness is about 0.0075”. The thin walls and high cell density result in a huge surface area to face area ratio (meaning more catalytic activity); quicker responsiveness at low temperatures; and less resistance to flow. This has been one of the best innovations in the hearth industry over the last decade, but you wouldn’t know it by talking to HPBA. Upstream of the catalyst is a high-temperature alloy screen that collects fly ash (like the lint trap in a household dryer) and reduces the need to inspect or clean the catalyst. The catalyst manufacturer explicitly states that performance will begin to decline noticeably at moisture contents above 30%, but we conducted the tests anyway. The two cordwood tests above were conducted with maple, because it is the most available local species. We are having some wet Douglas Fir cordwood shipped to us, so that we can conduct additional tests with it. We intend to conduct a series of tests over the next few weeks with different models, different fuels, and with cold starts as well as wet wood. Any regulator who would like to visit during future tests would be most welcome. If any of you have a particular test that you would like to see, please let me know and we will do our best to oblige. In my opinion, easing woodstove regulations because non-catalytic stoves don’t burn cleanly at low temperatures, low flow rates, or with wet wood, would be a regulatory failure. Ultimately, to help the EPA determine the Best Demonstrated Technology, I suggest we have a “burn off.” We should get a quality non-catalytic stove and a quality catalytic stove and run them through efficiency and emissions testing using EPA loads, cordwood loads, wet cordwood loads, cold starts, and 12 hour burns. I would be surprised if the catalytic stove didn’t perform consistently better on every test. How long will your new catalyst and alloy screen last if you only burned wet wood (36% moisture)? 3 years or less? How much does a catalyst and alloy screen cost to replace, $300 or more? Wet wood should not have an effect the longevity of the steel catalysts, but it will delay light-off and suppress performance somewhat. The biggest problem with wet wood is that it is woefully inefficient (like moisture in your car’s gasoline). Replacement cost for the catalyst, depending on model, is between $125-$175. The first three years has a full warranty. The screen cost is not terribly costly either, let us know which model you have and we can get you a cost.